For the second time in as many weeks, I encountered a nighttime driver with no lights on. Coincidence? Well, yeah...but it's also a sign of a trend that should be more disconcerting to drivers. More cars are being fitted with electroluminescent gauges (they light up even during the day and are invisible when the car is off), but without light-sensitive head- and taillights. This leads to people driving around at night thinking their lights are on because their gauges are lit. 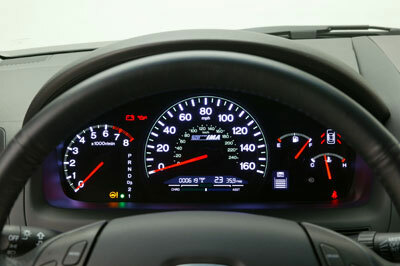 The problem is, most people turn on their lights when they can no longer see their gauges. The new gauges have obviously eliminated that issue, so people forget to turn on their lights. This is the kind of thing that happens when manufacturers don't think about the true cost of their techno-goodies. Sometimes, when you want to impress buyers with one feature, you've gotta throw in another one to compliment it. Speaking of lights and backfiring features...I've wanted to get this pet peeve off my chest for a while. It appears that all recent GM vehicles use their backup lights as area illumination. The upshot of this is that when you're circling a parking lot at night looking for a spot, and you see a GM vehicle with its backup lights on, it could either mean that car's about to back up, or that the owner is somewhere in the vicinity of their vehicle...but not inside. 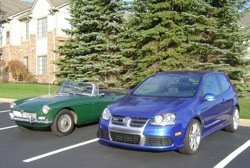 If Bob Lutz reads other auto blogs around the web in between posting his own, I hope he sees this and insists on compensating me for the countless minutes I've lost waiting for the parking spots of unmanned GM vehicles. Bob, please make the check out to one Mr. A. Snob. I'm with you on this one, brother! It is a problem. Remember the old Chrysler cars that would actually say "Your door is ajar"? What if the car would say, after dark, "Your lights are amiss"? Speaking of stupid GM, what about the cheap bulbs they use in the daytime running lamps? They burn out in about 18 months, and the owners rarely replace them, making the whole car look cheap and ill maintained. hahahhahaa you crack me up REL!